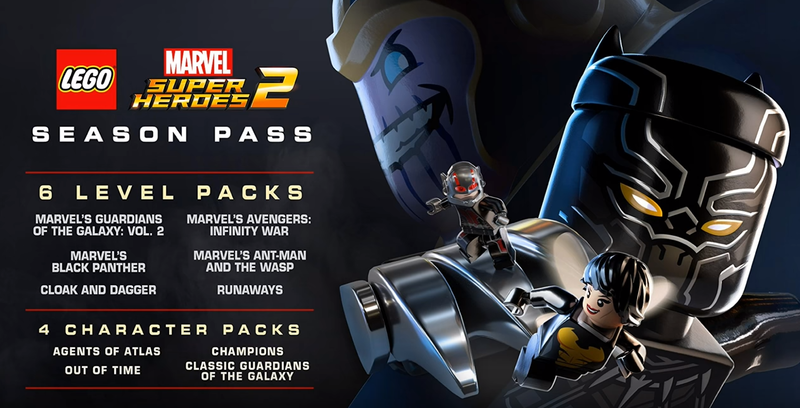 The announcement of the deluxe edition for Lego Marvel Super Heroes 2 revealed the existence of a Season Pass, something that has been common for the last few Lego games, but there was no details on what was included with it other than it gave you access to a classic Guardians of the Galaxy character pack. Over the weekend a thread started on NeoGAF leaked what seemingly will be included in the pass, and if true, it reads like a promotion of Marvel’s upcoming slate of film and TV projects. The image in the thread lists six levels that can be downloaded with the pass: Marvel’s Guardians of the Galaxy Vol. 2, Marvel’s Black Panther, Marvel’s Ant-Man and the Wasp, Marvel’s Avengers: Infinity War, Cloak and Dagger and finally Runaways. It also lists three character sets that will become available for download along with the classic Guardians of the Galaxy: Agents of Atlas, Out of Time, and Champions. This information has not been officially released by either WB or TT Games, but should they confirm this as fact, a new news post will be written to reflect it . Lego Marvel Super Heroes 2 arrives November 14th on PS4, Xbox One and PC and Nintendo Switch at a later date. I’ve rewritten some of this article as the legitimacy of this has come into question.